Pilots angry over proposed wages and pension changes. Spirit Airlines is canceling all of its flights through Tuesday, stranding thousands more passengers after the airline's pilots went on strike. “None of the planes are moving and none of our pilots have crossed the picket line,” Paul Hopkins, strike committee chairman of Spirit's unit of The Air Line Pilots Association, said Sunday. The privately held airline, based in Miramar, Fla., carries 16,680 passengers per day -- about 1 percent of the U.S. total -- mostly between the eastern U.S. and the Caribbean and Latin America. 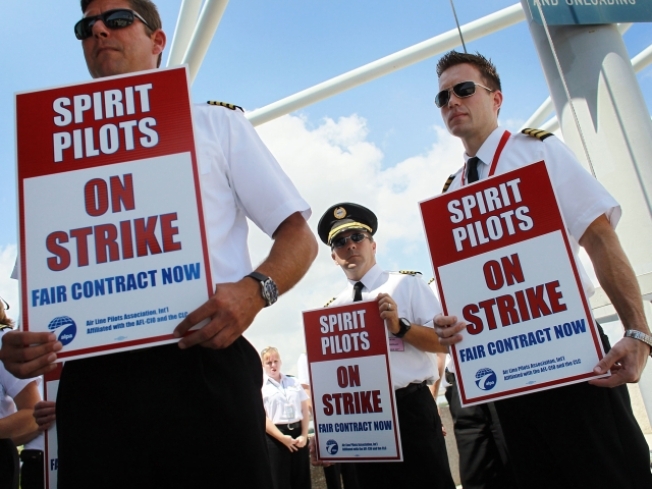 Spirit's CEO said this weekend that no talks were scheduled with picketing pilots. The shutdown continues to cause major problems for Spirit's flyers. The airline said it is refunding fares for flights Saturday through Tuesday plus offering a $100 credit toward future flights as it tries to get its passengers booked onto other airlines. Spirit said Sunday it offered to raise pilot pay by about 29 percent over five years -- a move that would have cost the company an additional $70 million. Work rule changes would mean pilots would have to fly more to earn that money, however. Spirit's offer also kept a four-day break between every pilot trip, something the company said no other ALPA contract has. The offer also included a $3,000 signing bonus and a larger retirement plan match. But Capt. Sean Creed, chairman of the Air Lines Pilot Association group at Spirit, said Sunday that the company's offer only matches inflation. He said that he's looking to have wages for Spirit pilots competitive with those at rivals like JetBlue Airways Corp.
Creed noted that a captain with 10 years' experience at JetBlue earns about $158 an hour; that compares with $138 an hour for a Spirit captain with 15 years' experience. Baldanza said in an interview Saturday that Spirit has made money over the past year and a half and he knew its pilots would need raises. He had added that he hoped to get some of Spirit's 31 aircraft flying soon with management pilots or others who cross the picket line. No such flights have yet taken place. The carrier has about 440 active pilots. The strike is being closely watched in the industry because pilots at much larger carriers, including AMR Corp.'s American Airlines, are also locked in tough negotiations. The last strike at a major carrier was in 2005, when Northwest Airlines mechanics walked off the job rather than accept deep pay cuts. The strike failed after Northwest replaced them.